I am so lucky and honored to be included in the following treasury! The treasury is called "All the Fun of the Fair" by tinyminds. It is a selection of whimsical sights that you can see when you go to the fair. My carousel necklace was included! I love love carousel, all the horses moving to the joyous music. 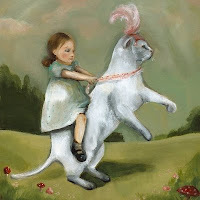 Out of the picks in the treasury, I found this print "Eunice" by amberalexander rather fun and cute! I have never seen a circus cat before.. But I thought it was a fun picture. Congratulations on being included in such a great treasury. That carosel is just too neat!!! I love it! your carousel is so sweet, congrats on the treasury! I just love the feeling you get when you see that someone has picked one of your items to include in a treasury! You deserve it...very cute piece! Your carosel is so cute. Congrats. Sleightgirl, llena, Margaret - Thanks! Rheea - Thanks for the encouragement! 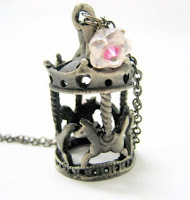 OMG, I've had that carousel necklace in my favorites for a while. I HAVE to get it soon!